(Now? The SI?) For many still overawed by the pronouncements of the Situationist International the names of Jorgen Nash and Jean-Luc Godard ring out as benchmarks of counter-revolutionary cultural activity. Godard, the darling of the Nouvelle Vague and regular contributor to Les Cahiers de Cinema, came in for an especially strong dressing-down.Yet when you return to these passages from the mid 60s what is striking is the flimsiness of the so-called critiques. What the anonymous author of The Role Of Godard and Cinema & Revolution seems to be rejecting is not the films themselves but their reception in the media and the academy. Deeper research may reveal that Godard was in collusion with such a reception and that he may have been inspired by the films of the SI, but the SI nonetheless reveals itself, in the former article, to be in collusion with the dictates of high art when, in affording Godard “the consistent expression of a subjectivity” they qualify this as a “subjectivity on the level of a concierge educated by the mass media” (1). In the latter article Godard is contradictorily berated as being “not even … capable of the slightest personal originality” (2). So, in their impatience to denounce Godard, the Situationists drop their guard to reveal not only a class snobbery, but an assessment of culture as a site of competing individualities and not as that which can destabilise our idea of individuality. Moreover, as revolutionaries attacking a bourgeois culture which is for them epitomised by Godard’s pseudo political stance in such films as Masculin/Feminin, they do not take cognisance of how their falling back on such a notion as ‘personal originality’ in their ‘critique’ of Godard is precisely to mobilise the very lynchpin of bourgeois culture they want to be seen to be attacking. This problem of ‘originality’ was one that the Situationists were keen to overlook. The practice of detournement, whilst ostensibly resolving this problem, is one that, in re-appropriating imagery and ideas, does not do away with the misleading status of ‘possession’. That Situationist texts are littered with denouncements of theorists and practitioners whom they drew upon and then claimed to have surpassed may be a point in case. Such manoeuvres, untroubledly legitimated by the SI’s self-appointed status as a revolutionary organisation, have the aftereffect of accruing to themselves the status of ‘originators’ rather than participants in the culture they sought to overthrow. Thus, in the Cinema and Revolution article the anonymous author – presumably Guy Debord – announces himself in the third person as beginning work on a film version of the Society Of The Spectacle. We are to presume from the tone of the article that this work will be a true original; indebted as it is to Eisenstein’s project to make a film version of Capital. But even though Debord’s work is a polemical tour-de-force of roughshod innovation, a film that is unafraid to institute its own form, it is a film that seems to flounder on its own reputation. It is outside the canon but forms its own canon wherein its director becomes the ‘possessor’, the arbitrative filter, of both the theory and the images. In this way the film falls foul of the last sentence of Thesis 108: “Detournement has grounded its cause on nothing external to its own truth as present critique” (3). Watching the Society Of The Spectacle we are witness to the tragedy of one man taking-on the historical dynamic of capitalism in the name of a class that he once forgot himself enough to insult. Is it such a pervasive atmosphere of loneliness that makes Debord’s film work against itself or is that, in increasingly coming to freeze its position as a premeditated ‘truth’, it seeks to freeze a continually moving social practice until any defence of such a ‘truth’ becomes filled with a moralistic nostalgia? The Society Of The Spectacle, as a manifesto which indicts an heteronomous society from the impossible and idealistic position of complete autonomy, comes to surmount the contradictions of practice that were to become increasingly central to a ‘cultural sphere’ that Debord and the Situationists rejected. 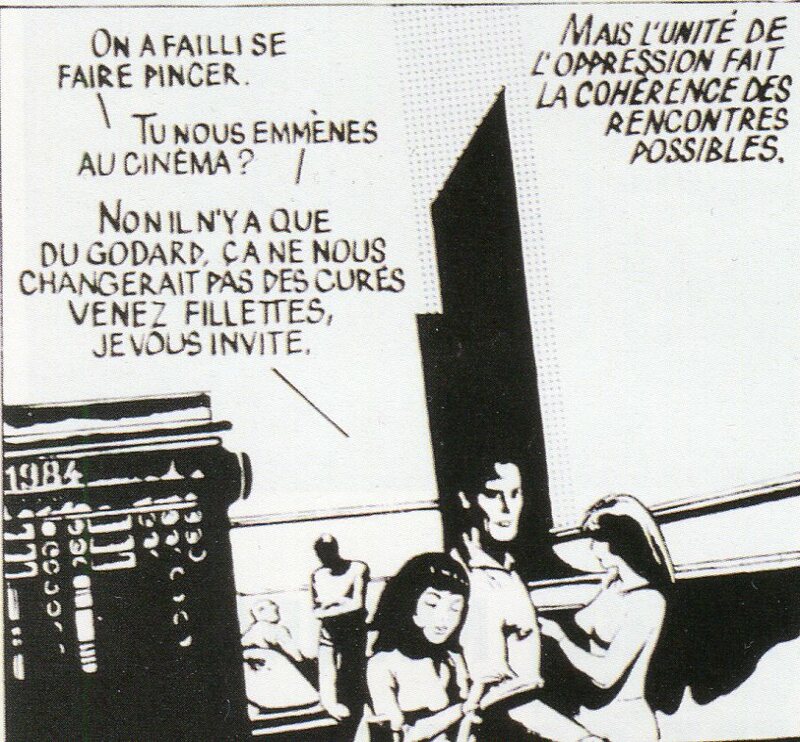 And so, it is no surprise that Debord’s disgust for Godard comes into sharpest focus when the latter uses popular cultural themes in his work: “His flaunted culture is largely the same as that of his audience, which has read exactly the same pages in the same drugstore paperbacks” (4). This disdain for popular culture and the ‘low’ arts as the products of a spectacular economy is what assures Debord his aloof separation from society: he disqualifies himself from the contradictory ground of practice and alienates himself from any common fight for autonomy that does not seek to conform to the ‘truth’ of Situationist theory. Godard on the otherhand, choosing a spontaneity that makes him receptive to contradiction and to the social relations that surround him, may not know what he is doing beforehand, but he at least ensures that the outcome is one that does not burden possible action with the moralism of ‘unrealizable injunctions’. Godard’s interest in popular culture, from the gangster films and westerns that he reviewed for Cahiers de Cinema to the rise of the pop industry and the counter culture, did not, as the Situationists suggest, compromise his politics, but made them somehow more elusive and paradoxical, more liable to be transmitted through the culture than those of Debord and the SI. In the long run they are a politics that we can see evolving and which do not discount the role of the imaginary, the absurd and the creative, but bring these in to political practice as necessary components of any movement towards social change. Whereas Debord assaults us with a ‘truth’ we have to accede to, with an offer of being disciple to his master, Godard, it seems, takes more risks with being imperfect, contradictory and inconsistent. He doesn’t shy away from being pretentious and exploratory and therefrom opens up the terrain between the screen and the spectator which Debord, in cinematically illustrating the ‘truth’ of his own theory, makes even more unbridgeable. The latter, by establishing an heteronomous relationship of passive dependency between himself and his audience seems to ensure that he expresses the ‘spectacle’ in his own practice and brings along with this an active disdain of our own ‘idiolectic’ potential to be more participants than spectators. If such closure and hermeticism as that of Debord’s is revolutionary then the Society Of The Spectacle is a revolutionary film and Godard, throughout all his works, was pampering to the public taste of imbecilic concierges.